Diwali, the festival of lights is one of the major and the most awaited festival for most of us. In those weeks of decorations and other preparations, we forget to register a few important tips to enjoy the festival without compromising on our safety. Here are a few points you must consider amidst your celebrations. Fireworks can really be fascinating for kids. Watch them at all times! Here are a few safety measures for them. • Make sure your kids wear closed shoes and thick close - fittingcotton clothes while playing with fireworks. • Ensure that you maintain sufficient distance from the fireworks by using an incense stick instead of a candle or match stick. • Make sure you hold the sparklers away from your body. • Keep a burn ointment or aloe vera gel and a water bucket handy. • Never allow your kids to play with fireworks unattended. Special care needs to be taken to keep the elderly at home comfortable. • Elderly with respiratory problems such as asthma, heart diseases, common cold and sinusitis must be kept away from places with high concentration of fumes. It would be wise to speak to your doctor about how to tackle increased pollution. He may increase the dosage of medications for a short period of time. • Nebulizers and inhalers need to be kept handy, as heavy metals like cadmium and lead present in fireworks make it difficult to breath. • Health hazards due to noise pollution like tiredness, headache, loss of appetite and lack of sleep may be seen. The use of ear plugs can help minimize excessive noise. • Stress, hypertension and annoyance are usually seen during this period. Have patience to handle them, and anticipate these changes in the elderly. • Pets have a heightened sense of hearing, so keep them in a familiar room indoors. Keep the windows and doors of that room closed. Draw the curtains to reduce noise. • Ensure someone is there with them to comfort them. Keep water and food handy. • Keep your fireworks away from your pets. • Use animal and environment friendly lights and diyas to decorate your house. • If your pet is prone to acute anxiety due to loud noise, consult with your veterinarian. Check his availability during the festival, in case of an emergency. 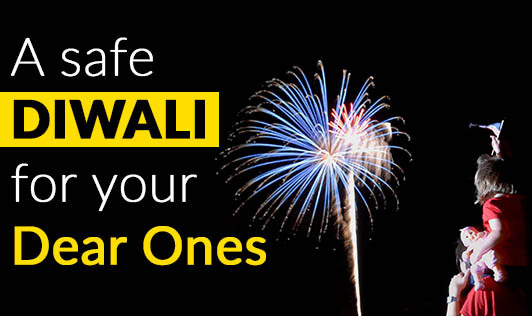 Enjoy a safe and healthy Diwali with your family and friends. Happy Diwali!